The most confusing and frustrating things about Oktoberfest are figuring out if you need table reservations in the main tents and how to get them. We have put together a guide to help make things go smooth. Oktoberfest in Munich isn’t your small time county fair, they average 660,000 daily visitors, but only have beer tent space for 120,000 people at a time. Only around 80,000 of these seats are in the main tents and around 30-50% of the seats are reserved by locals up to a year in advance. This leaves everyone else battling for the limited unreserved seats which can be very hard to come by in the evenings and all day on the weekends. You really have to be prepared and have a plan if you want your Oktoberfest visit to be stress-free. 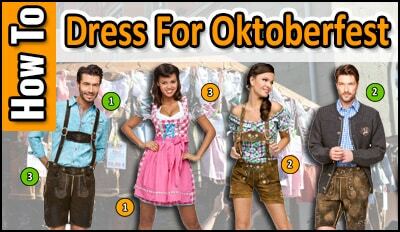 Do I Need A Reservation At Oktoberfest? During busy times (Weekdays after 2pm & all day on the Weekends) you either a pre-paid table reservation or need to be in line early to grab a seat in one of the unreserved areas of the tents. There aren’t general Oktoberfest tickets for sale as each tent handles their own reservations. Below we will cover how to get table reservations and what to do if you aren’t able to get one. Can’t get a seat? For the most part that means you can’t get a drink and once all the seats get taken you may not even get a chance to peak inside as they will often close the doors. The exception to the needing a seat to get a drink rule is the popular Hofbrau tent which keeps a standing room only area for a couple 100 visitors. But even for those spots you still need to get in the doors. Below we will explain how to get a reservation and what your options are if you don’t get one in time (Getting In WITHOUT A Reservation). Weekday Hours: 10am-11:30pm (Last Call 10:30pm), unreserved seats full by 2-3pm. Saturday & Sunday Hours: 9am-11:30pm (Last Call 10:30), must be in line by 5-6am to get an unreserved spot. Käfer Wiesn-Schänke & Weinzelt are open until 1am with last-call at 12:15. Reservations Times: Typically there are Lunch, Afternoon, and Evening slots available. Reservation times and cost vary, see our chart HERE. Remember that reservations have deadlines many months before Oktoberfest. Details highlighting reservation tips and how to get a seat without a reservation are listed below. Reservations can only be made directly through each tent as there are no general tickets to Oktoberfest in Munich. If you are a newcomer, you can pretty much forget about getting reservations on weekday evenings or anytime on the weekends in many of the tents as they will require a previous year’s customer number. For weekday lunch slots, some tents will let you request a reservation online, but most require a letter, fax, or in person visit to there office. The tents require you prepay for a full table (6-10 people) which you get back in food credit. Do not buy tickets from 3rd party groups or secondary sources unless you like to get ripped off. Weekday Reservations: You can often get table reservations during lunch on weekdays as long as you book between January-April depending on the tent. The evening reservations are largely limited to locals with a prior year’s customer number and sell out up to a year in advance. You can get tickets for the Hippodrom or Lowenbrau late night after parties North of the train station a little later as they don’t sell out for weekdays until 3-8 weeks early. Saturday & Sunday Reservations: Outside of tickets to the two late night after parties, you can pretty much forget about getting Oktoberfest table reservations on a weekend. You need to book your Oktoberfest table reservation between January-April depending on the tent. Booking requests for many of the tents must be submitted in January-February as they start allotting tables in March, so submit early. If you wait much longer than that the reservations will likely be fully booked. Most of the tents no longer respond to reservation requests outside of Weekday lunch slots as they are continually booked solid years in advance for ALL day each Weekend and every evening on the Weekdays. Don’t expect to get reservations for anything outside of Weekday lunchtime/early afternoon or for the late night after parties North of the train station. While most seats are 35 Euros, expect to pre-pay 25-50 Euros a person which is the cost of a 1/2 chicken and 2 liters of beer. In all of the major tents you are going to have to book an entire table of 8-10 people. It doesn’t matter if you have less than 10 people, you will have to reserve and pre-pay for the entire table. You pre-pay to secure your reservation, but you’ll get the money back in food and drink vouchers you can use on any menu items during the day of your visit. Any tips left for your server have to be in cash and can’t be taken from your voucher. Cost Chart Per Tent: HERE. You can pay directly at the office for each tent in Munich usually within two weeks of securing your reservation. If you don’t live in Munich, don’t worry as they will also give you the info to wire them the money directly. Your bank can help with this and it is really quick. Expect it can take into April until you get your official confirmation as they have so many early bookings that the initial rush can take 6 weeks to process. After paying you will get instructions on when and where to pick up your group bracelets when you arrive at Oktoberfest. When Is My Reservation Good For? Reservations are usually in 3-4 hour time slots. Weekends have a Lunch, Afternoon and Evening time slots while the Weekdays only take reservations for the Afternoons and Evenings. If you have an earlier time slot you will have to move once the people in the slot after you show up. We suggest being really nice to your server in hopes she can help squeeze you in somewhere after your time slot is over. For the most part, the beer tents won’t force you to leave after your reservation slot and should be able to accommodate at a new table you as long as you are still eating and drinking. Remember that you need to be on time or you forfeit your reservation, so make sure to be at least 15 minutes early. Reservation Time Slot Chart: HERE. 1. Go On A Weekday: If you don’t have reservations you’ll really want to plan your trip to be in Munich during the week. Weekends can be almost impossible to get into the tents without lining up by 5-6am, but on a Weekday can usually get into the tents until 2-3pm when the unreserved seats fill up. We suggest settling into your final destination between Noon-2pm depending on the tent to be safe. It is possible to get in and get booted from your seat after a couple hours if people with reservations for your seat show up but they will try to accommodate you at another seat if you are still eating and drinking. To avoid this, make sure to initially sit in a section/table marked unreserved or “Nicht Reservierter Bereich” in German. From 10am-3pm on Weekdays many of the tents and stands also have up to 30% off food. 2. Get There Early: By law, each tent has to keep a minimum amount of spots open for daily first-come-first-serve visitors which cannot be reserved ahead of time. The number of first-come-first-serve seats averages over 1000 per tent, but they still go very quickly. You’ll have to be there between Noon-2pm on a weekday to snag seats or if you’re in a small group (1-3 people) and get really lucky you may still be able to slide in by 3pm. From open at 10am until Noon on Weekdays, you can easily hop between tents before settling on a final landing place. Once you get one of the non-reserved seats you can stay all day. A good rule of thumb is to look on the front door because if the sign says Wegen Überfüllung Geschlossen, which means they are currently at capacity. On a weekend you’ll need to be in line 3-4 hours before the tents open to get a spot. Yes that means that by 5-6am you need to be in line. The latest that we have got in line at one of the main tent and still got in with the 1st wave was 6:30am and we barely got in. Just like on weekdays, you need to quickly seek out a section/table marked unreserved or “Nicht Reservierter Bereich” in German. 3. Hofbrau Standing Room Area: The Hofbrau tent is the only one where you can get served drinks without a seat in their special standing room only area or Stehbereich in German. As long as you get in early enough you can stay all day and night if need be. It is rowdy, fun and crowded in the standing room area, and there are no chairs, only high top tables. As we mentioned above, even with the standing room area you will need to by in line by 5-6am on weekends or arrive by Noon-2pm on a weekday. 4. Beer Gardens & Small Tents: If the 14 main tents are all packed you should check out their outdoor beer gardens. Each tent has an outdoor area with anywhere from 500-2000 seats where you can get served. If the gardens are also full, you may have to settle for trying your luck at one of the 18 smaller tents. This option means you may be able to drink, but you’ll miss out on the atmosphere of the large tents. Other great beer halls/gardens outside of the Oktoberfest grounds include Augustiner near the train station, Hofbrau in Old Town, and the Chinese Tower in the English Garden Park. 5. Keep Your Group Smaller: A group of 2-3 can be more easily accommodated than a larger group. With the smaller group you can sometimes get lucky and get a seat into the late afternoon with a lot of hunting on a weekday, but a large group always needs to get in line early. Once your group gets above 4-5 people you lose your flexibility and need to be there toward the early end of our suggestions so you can all sit together at one of the unreserved tables (By Noon-2pm on Weekdays & 5-6am on Weekends). 6. Visit The After Party: There is no longer Wiesn after party at the Hippodrom for Oktoberfest, but you can still go to the one to the NE of the train station at Lowenbrau which is a little more club-like. General tickets are 10€ with no set seats and long lines for service. VIP tickets are 214€ for a group of 4 which includes seat reservations, a bottle of booze, and a server. Lowenbrau After Party Website: HERE. Tickets: HERE. Can I Buy Tickets On Sites Like eBay? What About Joining a Tour Group? There are some tour guides that book entire tables who then sell the slots but they will charge you 100s of euros to be there guest as part of the “tour”. Not only do you risk not getting in since this is against the rules, but you are likely going to get ripped off. Even if you do choose to pay for a group tour, what they charge per person you could book an entire table yourself. With legit bookings the tents will charge you 25-40 euros per person which you get back in drink credits. We highly suggest reading our guide to Getting In WITHOUT A Reservation.